A lot of recent RPGs appear to be obsessed over creating these large, cinematic experiences with vast empty landscapes that take forever to traverse. 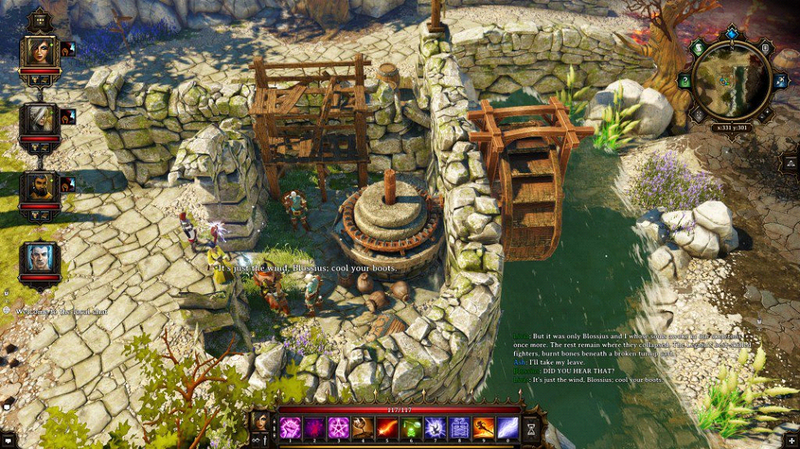 Larian Studios’ Divinity: Original Sin presents an alternative to this, one conscious of the genre’s history but unafraid to modernise. Isometric in viewpoint, turn-based in combat, and with an emphasis on writing rather than voice acting, Divinity is a breath of fresh air amidst genre stagnation. Divinity may not imitate current trends or be afraid to question modern tastes, but neither is it just some retro throwback. The game begins with a twist – create and customise two characters. Whilst it’s the perfect setup for the game’s cooperative multiplayer, it also forces the unusual dynamic of role-playing with and against yourself when flying solo. Playing two protagonists means, in just a single play-through, you get to experiment with two separate personalities as well as character builds. Should I play a lawful and compassionate altruist, or a vindictive narcissist hungry for power? Should I pick a claymore wielding Knight, or a powerful Pyromancer who can set the landscape ablaze? Divinity’s answer is to choose both. The game begins modestly, with the investigation of a councillor’s death. The townsfolk suspect foul play and the taboo use of a primeval magic known as Source. You play Source Hunters, a strange turn of phrase for particular accents, where ‘source’ sounds so similar to ‘sauce’. The quest for Tomato Ketchup to one side, the councillor’s death quickly unravels into a formulaic tale of scheming cultists, an otherworldly winter kingdom, astral planes and a universe-eating void that looms at you from a giant magical telescope. Divinity tells a stronger story through its many sub-plots. These aren’t your usual side quests, they continually feed back into the main story arc. It’s a game of immense detail, with little padding or filler. Much of the early game revolves around the town of Cysael, where it can take hours before you push out into the unknown through the town gates. Divinity is also the antithesis to the walking simulator. It’s not small in scope, but there’s no wasted space. You’ll never travel far before coming across some interesting encounter, event or hidden area. Exploration will always reward you with some vital information, a clue or item which, looping back around, will be used later to expand the story. Beyond Divinity’s organically developing plot, the character system stands out as particularly adaptable. You begin by picking a class, but it’s more than possible to change or develop a hybrid as you journey. You could mix heavy armour and melee weapons with witchcraft, or bolster your pickpocketing scoundrel with the skills of a ranger so that they can fire a crossbow. On top of these abilities there are a number of specialised talents, special feats/perks that allow for considerably more personality and uniqueness. Amongst them, Pet Pal is a talent which allows your character to converse with the animals of the world. There’s a clairvoyant cow that has a lot to say – little of which is of use, a stray dog who’ll give you a helping hand, as well as more than a few dungeon rats who’ll feed you clues for finding hidden treasure. Character choice in Divinity is meaningful at every level, but It’s also comparatively streamlined compared to many classic cRPGs. With two main characters, and two additional companions whom you can pick up early on in the game, a lot of bases can be covered. This is excellent for those looking to play through the game only once or twice, less so for those who spent a thousand hours trying to make a dexterity fighter work in one of the Dungeon & Dragons games. Divinity also features a number of social abilities. They don’t unlock dialogue options, but rather help you win arguments through the rock, paper, scissors mini-game. These skills can be used to avoid confrontations, but also to roleplay and argue different points of view amongst your main characters. It’s an interesting gimmick, but it isn’t particularly compelling in the long run. Companions are lacking, if not in personality, then in any kind of plot involvement. They unquestioningly follow your lead. There’s the occasional discussion or disagreement, but as you control both protagonists, within the chaos of dissenting views it’s impossible for a real fracture or confrontation to take hold or develop within the party. The characters in Divinity certainly lack the kind of depth and evolution one might expect to see in a Bioware game. The characters in Divinity may be a little one dimensional, but they’re very well written. The story may not be led by the voices of Patrick Stewart or Liam Neeson, but Divinity creates a powerful sense of place and some very compelling moments using just the written word. As mentioned, details are important, which means you won’t get far by skipping through dialogue. Divinity can be a little obtuse at times; many of the quests and objectives require a level of engagement atypically found today. For those who need things spelt out for them – or further, placed right in front of them – Divinity might seem too archaic. However, as difficult as some of the quests and puzzles can be due to this, the lost art of critical thinking can also reinvigorate that sense of adventure and discovery. The world of Divinity is dense. The plot being as lean as it is, and the content as concentrated, means there’s a lot crammed within the world of Rivellon. Exploration is rewarding, because you know when you find some dungeon nook, there will always be something there of interest. The secrets in Divinity are one of its greatest strengths. There are more than few to discover; hidden switches behind paintings, basement doors hidden under old carpets, great treasure chests that appear unreachable, invisible entrances protected by magic incantations. 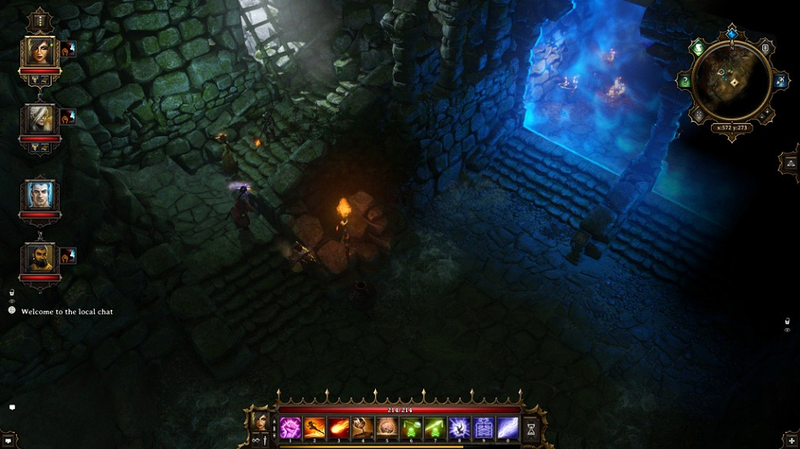 Divinity is an adventure in the purest sense – one filled with traps, riddles and secret passageways. 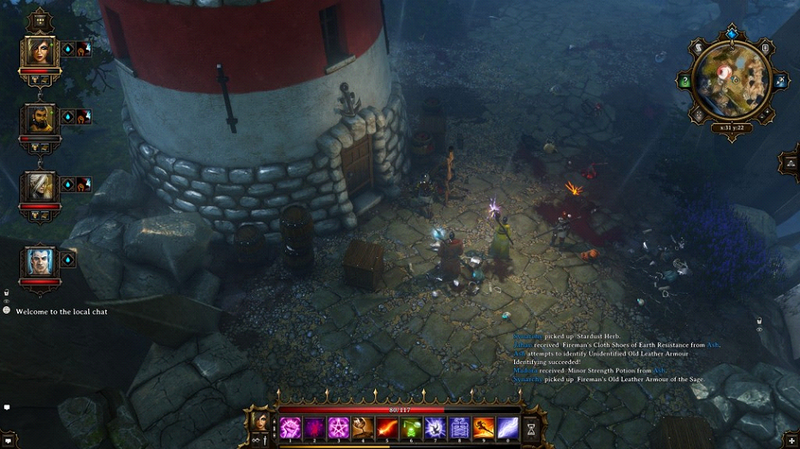 Divinity is one of the very best looking isometric games, with some fantastic lighting and effects. The world feels alive, and creates a great sense of place through its physical simulation. Every item in the game has programmed properties, which means there are a lot of things you can play around with. It might seem trivial, but there are those who spent hours tinkering with objects on shelves in the Unatco HQ in Deus Ex. They exist. Similarly, in Divinity, a locked door can be smashed down or burnt through, furniture can be moved (burgled and fenced) and objects can generally be toyed with. Whilst smashing wooden crates with your staff can be a worthwhile endeavour in itself, the materiality of the world only really comes into its element during the game’s turn-based combat. Suddenly objects are given meaningful spatial presence; they become obstacles, barriers, even projectiles. When in combat characters have a number of action-points to use during a turn. Every action costs points; moving, swinging your weapon, casting a spell, manipulating objects in the environment. Combat becomes even more elaborate with the introduction of the elements. Spells in Divinity have precise properties. Fire spells ignite the battlefield, burning enemies and spreading wildly through pools of oil. Without fire, spills of oil will slow those who attempt to run through them. If you’re missing the oil spell from your repertoire, you can instead have your Knight hurl nearby oil barrels (conveniently placed) into the enemies’ midst. If your wizard has poison spells you can add these to the experimental concoction too. Or, maybe you’re mage can teleport a nearby barrel of gas on top of a burning foe’s head instead. Divinity’s answer is of course, choose both – either way, there’ll be plenty of fireworks. These kinds of elemental synergy might set off deadly chain-reactions, but the combinations are also available to enemies. All it takes is some crafty necromancer to drop a poison-filled meteor on you and your companions, and a skeletal archer to shoot the ground nearby with a fire arrow, and your whole plan will be up in smoke. Combat is a delicate balancing act that requires a fair bit of thought. Perhaps you’re able to predict the enemies’ schemes, so you split up and stick fire shields on everyone. Alternatively, you could have your mage clear the poison from the ground with a tornado. Control of the battlefield is often more important than laying waste to foes haphazardly. Some battles can last up to twenty or so minutes, the environment morphing with elemental excess and the ground criss-crossed with structured chaos. What might have started out as a great wildfire could turn into a soggy mess as things wind down. With ranged combatants blind from dark steam clouds, those remaining meet in the middle of a great puddle to bash what remains out of one another. A puddle you say? Now you wish your two-handed axe were imbued with electricity! Divinity’s combat rewards improvisation as much as great tactical play. Tried and tested strategies will wear thin by the end of the game, yet you’ll naturally have built up a bank of deadly combinations and appropriate responses by then. 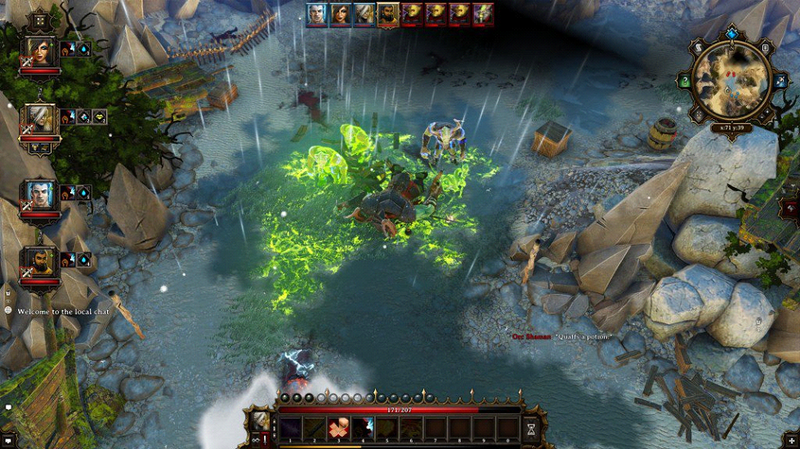 Divinity is a challenging game, but that makes the combat doubly rewarding. Encounters will constantly force you into changes of pace, with some foes resistant or even immune to your abilities. Whilst there’s always a theoretical solution, in practice some encounters can be difficult due to the character builds you’ve chosen. If you’ve decided to specialise solely in pyromancy, and then come up against a group of flame-resistant skeletons, you’ll be forced to adapt or re-load trying. 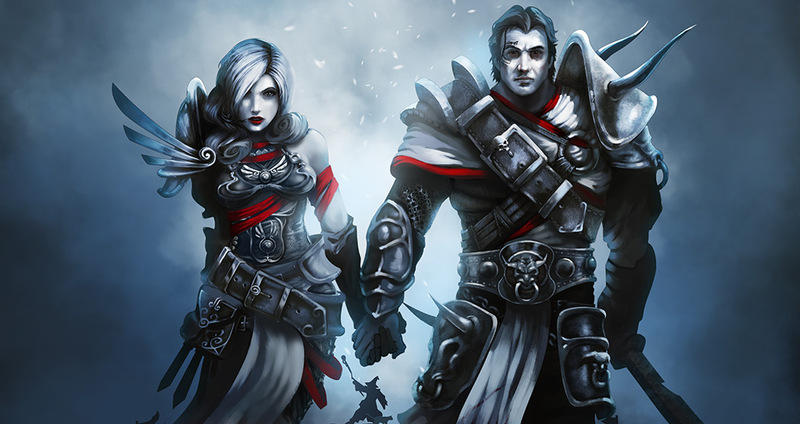 Divinity: Original Sin might not be the biggest RPG, but it’s certainly one of the most detailed. There are some big ideas here; the physical simulation, deep and intricate combat, and an unorthodox approach to character roleplay. 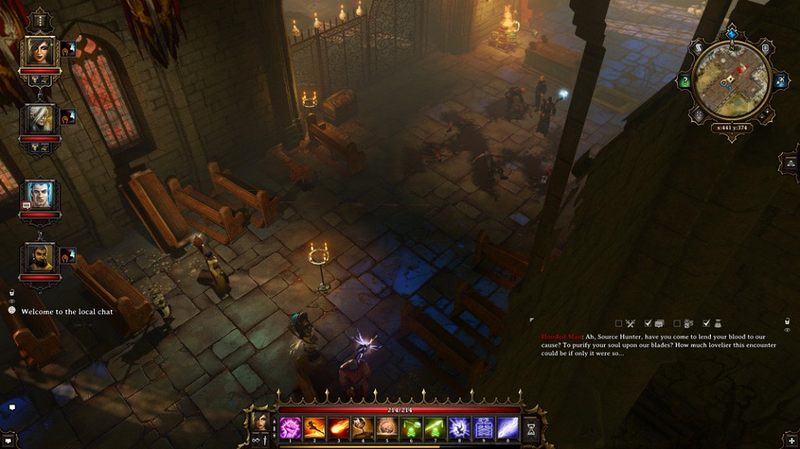 Unarguably, the developer’s finest game to date, Larian has succeeded in creating a modern RPG by implementing a complex set of systems, rather than just giving things a modern lick of paint.